The External Affairs Minister, Smt. Sushma Swaraj had replied to the letter written by CPI(M) General Secretary, Sitaram Yechury drawing her attention to a flyer brought out by the OFBJP Malaysia on the occasion of the International Yoga Day celebrations. While appreciating the fact the flyer was withdrawn subsequently on the intervention of the ministry, Sitaram Yechury has asked the minister to punish those who misused the offices of the ministry, while also urging her to convey to the BJP and its affiliates that they should not misuse such government initiatives/programmes for their own partisan propaganda. The copy of the letter sent by Smt. Swaraj and the reply of Com. Sitaram Yechury are being released herewith. Thank you very much for your letter No. 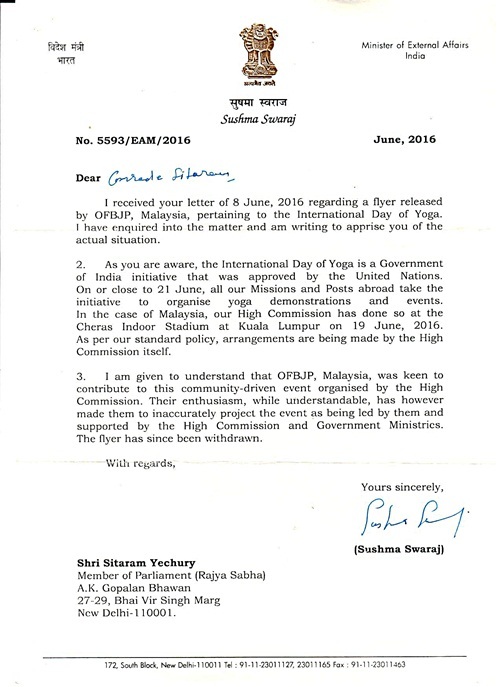 5593/EAM/2016 of June, 2016 in response to my letter of June 8, 2016, drawing your attention to a flyer brought out by the OFBJP Malaysia on the occasion of the International Yoga Day celebrations, in which they have claimed that the event is being supported by the High Commission of India, Ministry of External Affairs, Ministry of Ayush and the Indian Council of Cultural Relations. I appreciate that following your intervention the flyer issued by the OFBJP has been withdrawn. Drawing from this episode, I hope you are taking the next logical step to punish, in accordance with law, those who have so brazenly misused the offices of your ministry and mission in Malaysia. I am sure that you would strongly convey to the BJP and its affiliates that they should not misuse such government initiatives/programmes for their own partisan propaganda.